Former New York attorney general Eric Schneiderman won't face charges after multiple women accused him of sexual assault. Melissa Russo reports. Former New York Attorney General Eric Schneiderman will not face charges over allegations of assault, the Nassau County District Attorney's office said. In May, Schneiderman resigned from his post after four women with whom he'd been romantically involved accused him of physical violence in a story published by The New Yorker. Nassau County District Attorney Madeline Singas on Thursday said the women's accusations were credible, but maintained legal obstacles had kept the attorney's office from filing charges against Schneiderman after a six-month investigation. "I believe the women who shared their experiences with our investigation team," Singas said in a statement. "However, legal impediments, including statutes of limitations, preclude criminal prosecution." Schneiderman resigned several hours after the New Yorker story was published, saying that "while these allegations are unrelated to my professional conduct or the operations of the office, they will effectively prevent me from leading the office's work at this critical time." The probe found no misconduct by Schneiderman's staff in the attorney general's office, Singas said. Schneiderman said he didn't consider the decision an exoneration. "I recognize that District Attorney Singas' decision not to prosecute does not mean I have done nothing wrong," he said through a publicist. "I accept full responsibility for my conduct in my relationships with my accusers, and for the impact it had on them. "After spending time in a rehab facility, I am committed to a lifelong path of recovery and making amends to those I have harmed. I apologize for any and all pain that I have caused, and I apologize to the people of the State of New York for disappointing them after they put their trust in me." Schneiderman, a Democrat, resigned from office in May hours after The New Yorker published an expose saying that four women had accused him of slapping or choking them. Some of the women said Schneiderman was a heavy drinker. Schneiderman at the time didn't deny the allegations, but implied in a statement that his conduct was either welcomed or was not as the women described. 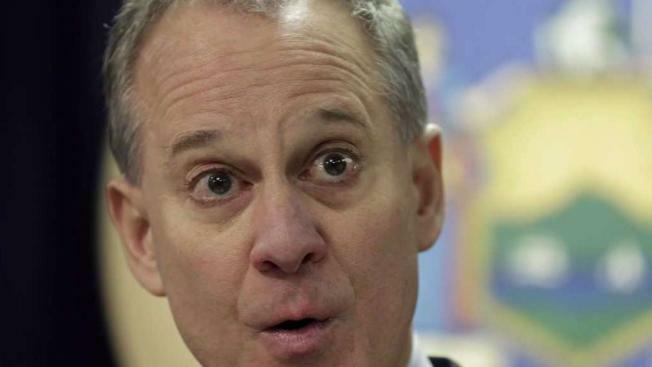 His accusers included Michelle Manning Barish, a Democratic activist and writer, who was romantically involved with Schneiderman from mid-2013 through the end of 2014. She tweeted Thursday that she wanted an admission of wrongdoing, an apology and for Schneiderman to donate millions of dollars left in his campaign coffers to women's shelters and domestic abuse programs in the state, "or I will fight." Gov. Andrew Cuomo appointed Singas as a special prosecutor, bypassing Manhattan District Attorney Cyrus Vance Jr. because of a potential conflict of interest. At the time, the attorney general's office was investigating how Vance's office had handled a sexual misconduct allegation against movie mogul Harvey Weinstein.